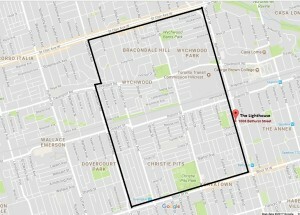 The Lighthouse Food Bank provides a three day supply of food, once every seven days, to individuals and families who live in The Lighthouse’s catchment area (north of Bloor, south of St. Clair West, west of Bathurst, east of Dovercourt/Oakwood). The Lighthouse is open every Tuesday and Wednesday afternoon between 1-3 p.m. There are regularly about 250 households registered for food-bank assistance (this is equivalent to approximately 324 adults and 116 children). The main sources of food are the Daily Bread Food Bank and Second Harvest, with additional donations from various churches in the GTA who collect and deliver food donations on behalf of their members. Personal advocacy and assistance are regularly provided to Food Bank clients who require help or answers regarding access to hydro, bill-payment concerns, landlord-tenant issues and the like. The Lighthouse offers information and assistance in a safe and welcoming environment, endeavouring to treat all participants with dignity and respect. Income tax assistance is provided to anyone deemed to be a low-income individual (set criteria) during the months of March and April. Appointments are necessary. Call or email Tiffany at 416-535-6262 and tiffany@lighthousecentre.ca after February 15th to ascertain eligibility and schedule an appointment. Every year in December, The Lighthouse organizes a special Christmas luncheon for its Food Bank clients. Participants enjoy a traditional Christmas dinner at The Lighthouse Centre prepared by Food Bank volunteers and other friends of The Lighthouse.